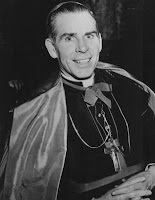 Last week I was pleased to read the Pilot article authored by Dr. Dwight Duncan concerning the proposed canonization of Archbishop Fulton J. Sheen. His reputation for interacting with popes and presidents was widespread and well-deserved. What many people do not know, however, is that he was often at his best when exercising the “common touch” of relating to ordinary working men and women. He had a special affinity for those who were less fortunate or struggling with crushing personal problems that challenged their faith. The Pontifical Society for the Propagation of the Faith remembers Archbishop Sheen with particular affection because he served as our National Director for sixteen years. During that time, not only was he a champion for the missionary work of the Church from his post in the National Office in New York, he made numerous personal trips to mission territories in order to observe firsthand the work supported by the Society. Heavenly Father, source of all holiness, You raise up within the Church in every age men and women who serve with heroic love and dedication. You have blessed Your Church through the life and ministry of Your faithful servant, Archbishop Fulton J. Sheen. He has written and spoken well of Your Divine Son, Jesus Christ, and was a true instrument of the Holy Spirit in touching the hearts of countless people. If it be according to Your Will, for the honor and glory of the Most Holy Trinity and for the salvation of souls, we ask You to move the Church to proclaim him a saint. We ask this prayer through Jesus Christ, our Lord. Amen. For more information on Fulton Sheen, click here to visit the Propagation of the Faith’s page on the World Mission Rosary. Started by Archbishop Sheen in 1951, the World Mission Rosary is a simple yet effective way to “embrace the world in prayer.” Our website also includes a link to the Sheen Foundation.